Announcing the Hummingbird Hat and Baby Bird Blanket Knit-a-Long with Lion Brand and Knots of Love! I am so excited to share something that I’ve been keeping a secret for months! Today, I’m kicking off the Hummingbird Hat and Baby Bird Blanket Knit-a-Long with Lion Brand and Knots of Love. This set of free knitting patterns includes a stretchy hat available in 12 sizes from 2 lb. preemie through adult large and a textured baby blanket available in preemie blanket, stroller blanket, and baby blanket sizes. Both patterns are designed for donation to Knots of Love, but you can also make your versions to gift, to keep, to donate locally, or to sell. How to enter the end-of-KAL giveaways for great prizes. Last year, I was crocheting on the subway (as I do almost every day during my commute), when a nice young man started chatting with me about what I was making. It turns out that his mother is the founder of Knots of Love, an organization that I featured in this charity spotlight post back in 2016. The Intensive Love Blanket in Lion Brand Heartland yarn is a free crochet pattern designed for donation to Knots of Love. Knots of Love is a nonprofit charity that distributes handmade hats to people experiencing traumatic hair loss due to injury or illness, and handmade preemie blankets to infants in neonatal intensive care units around the country. They actually donate over 4,000 blankets and hats each month (which adds up to over 330,000 hats since they were founded in 2007). When Lion Brand reached out to me about designing a pattern for charity, I knew Knots of Love would be a great organization to work with. If you’re new to Knots of Love, you can learn more about them in this short video. Knots of Love only accepts donations of hats and blankets made with very soft, machine washable yarns. These are the best for the sensitive skin of the people they distribute hats and blankets to throughout the country. Five super soft yarns from Lion Brand (Heartland, Jeans and Jeans Colors, Feels Like Butta, and Landscapes) are on the approved yarns list for Knots of Love. You can read more about how to donate to Knots of Love here. I’ve designed a cozy hat and blanket set in Heartland with Knots of Love in mind. Both patterns are simple enough for a dedicated beginner but beautiful enough that more advanced knitters will want to join in. Join in by knitting each of the patterns. You can make your versions to donate to Knots of Love or a local charity, to gift, to sell, or to keep. Share your progress on social media. Tag your project with #lionbrand, #knotsoflove, and #undergroundcrafter. You can also tag me as @UndergroundCrafter on Facebook, MarieInNYC on Ravelry, or @ucrafter on Instagram or Twitter. If you’d like to chat with other knitters, join the Underground Crafters Facebook group or visit this thread in the Underground Crafter Ravelry group. Share your completed project pictures below by 11:59 p.m. Eastern on May 30, 2018 for your chance to win great prizes, including yarn, stitch markers, and needles. At the end of the KAL, you’ll have at least two great projects to donate, gift, sell, or keep. These links will be updated as patterns are released throughout the KAL. New links will also be shared in the Underground Crafters Facebook group and this thread in the Underground Crafter Ravelry group. The Hummingbird Hat is a stretchy hat that uses a stitch pattern that can be knit in the round or knit flat and seamed. The pattern is available in 12 sizes from 2 lb. preemie through adult large. 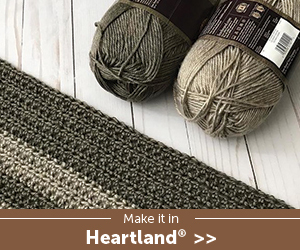 Lion Brand Heartland yarn (5 oz/142 g/251 yd/230 m/100% acrylic) – 1 skein each in your Main Color and a Contrasting Color, or approximately 251 yd (230 m) in each of 2 colors in any medium weight yarn. For my versions, I used 195 Biscayne as the main color and 98 Acadia as the contrasting color for the preemie sizes. I used 149 Great Smokey Mountains as the main color and 195 Biscayne as the contrasting color for the larger sizes. US Size 8/5 mm knitting needles, or size needed to obtain gauge. This pattern can be knit flat on straight needles or in the round using double pointed needles or on circular needles using the magic loop method. Clover Quick Locking Stitch Marker Set (optional, but helpful if knitting in the round or to mark repeats in pattern). The Baby Bird Blanket uses the same stitch pattern from the Hummingbird Hat along with a traveling stitch pattern for added texture. For the preemie size (suitable for donation to Knots of Love): 1 skein each in your Color A and Color B. For the stroller blanket size: 2 skeins each in your Color A and Color B. For the baby blanket size: 3 skein each in your Color A and Color B. For my versions, I used 178 Pinnacles as Color A and 156 Guadalupe Mountains as Color B. US Size 8/5 mm 30” (100 cm) circular knitting needles, or size needed to obtain gauge. Clover Quick Locking Stitch Marker Set (optional, but helpful to mark repeats in pattern). Once you have your yarn, you can check your gauge with this swatch pattern. Since some knitters think of gauge as a cuss word, let me answer an important question about this swatch before we get started. Do you “need” to check your gauge? Only if you are concerned about the finished size of your hat. If you don’t mind if your 2 lb. preemie hat actually fits a teenager, or that your adult size hat is too small for a pre-schooler, then there is no need to check your gauge! Since there are a lot of head sizes in the world, it is likely your hat will fit someone. It just may not fit the person you expected it to fit. 20 sts = 4″ (10 cm) in pattern. For best fit, always check your gauge. Row 1: (RS) *K3, p1, k1, p1; rep from * across. Row 2: *K3, p3; rep from * across. Rows 3-6: Rep Rows 1-2 twice. Row 7: *P1, k1, p1, k3; rep from * across. Row 8: *P3, k3; rep from * across. Rows 9-12: Rep Rows 7-8 twice. Rep Rows 1-12 until swatch measures approximately 4″ (10 cm), ending after Row 6 or Row 12. If you have trouble reaching gauge, watch this video for tips on making adjustments. Knit-a-longs are more fun with prizes, don’t you think? I’ve teamed up with Lion Brand, Clover, and Search Press to bring you some wonderful prizes. Clover will be providing one set of Clover Quick Locking Stitch Markers to each of two winners. Search Press North America will be providing one lucky winner with 3 books: 200 Stitch Patterns for Baby Blankets by Jan Eaton, Knitted Hats by Monica Russel, and Knitted Beanies by Susie Johns. To enter the end-of-CAL giveaway for your chance to win one of the prizes listed above, share share a picture of your completed Hummingbird Hat and Baby Bird Blanket projects using the link up below by 11:59 p.m. Eastern on Wednesday, May 30, 2018. You may share one picture of each project you complete using a KAL pattern. Each completed project will count as one entry in the giveaway. Giveaway winners will be chosen from these entries at random. Each will win one of the end-of-KAL giveaway prizes. Don’t forget to join the fun on Facebook and Ravelry, too. You can share as many pictures as you like in the groups, but only pictures submitted here will be entered in the giveaways. Edited to add: Congratulations to our giveaway winners, GigiGinny, Maddie2, meg2cats, and eyenowhour on Ravelry! Are you ready to join the Hummingbird Hat and Baby Bird Blanket KAL? Feel free to share our KAL button on your Ravelry project page or elsewhere on social media to spread the word. Just right click on the image to save it to your computer. Introduce yourself in the Underground Crafters Facebook group or this thread in the Underground Crafter Ravelry group. I can’t wait to see what you make with these patterns! I’d like to participate too please. I would like to join!!! I just found out about this project and ordered my yarn. It’s not supposed to come in until 5/28-30 so I’ll try to get a little hat done. Recovering from broken ankle, so also ordered yarn for the Anthology and Heritage blankets. I’m sorry to hear about your injury, Diane, but hope you get in plenty of knitting during your recovery. Pingback: Marie: NYC Designer & Entrepreneur • Knit's All Folks!